If you’re like most of your HR and compensation colleagues, you could use some input on building successful rewards programs. There’s a lot to consider! 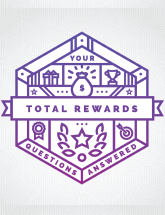 A total rewards program is made up of several elements — WorldatWork lists them as compensation, benefits, work-life effectiveness, recognition, performance management and talent development — so it’s no wonder that putting together successful packages is a complicated, sometimes stressful, endeavor. What extra benefits, aside from pay, can you offer to create a better workplace? What can you do to make your employees feel valued and appreciated?